High voltage capacitors are quite hard to come by and I made one for my fist attempt. Building and testing a capacitor with stuff you may have at home or can easily get a hold of is a nice experiment on its own. I tried to submerge my early capacitors in oil for improved dielectric and breakdown characteristics. This was messy and not very successful. Laminating tinfoil sheets worked well. Insulation break down tended to occur around 10kV but this could be improved with double laminating. Capacitance values were good and repeatable. Different values can be achieved by changing the overlap arrangement and thickness of the insulating sheet. Cut two equal sheets of tinfoil. 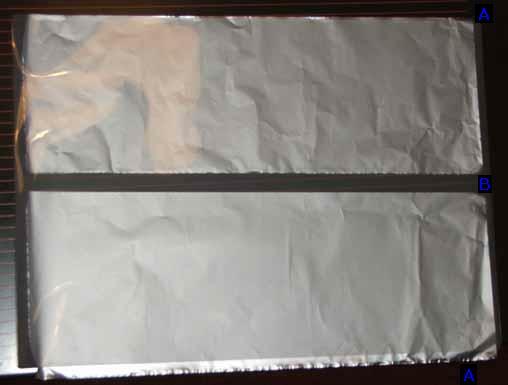 Then place them into a laminating sheet so that the tinfoil protrudes a few millimeters along the two sides (A) but is well enclosed by the plastic elsewhere. Leave about a centimeter gap in the middle (B). Feed the assembly into a hot laminator taking care not to crease or wrinkle the tinfoil. Guillotine the sheet in the centre gap (B) leaving equal insulated plastic on each resulting sheet. Warning: The mechanical action of disassembling this capacitor, can charge the plates differentially. It is therefore possible to receive a shock from them during this process. Place the two formed sheets on top of each other so that the protruding tinfoil is at opposite edges. 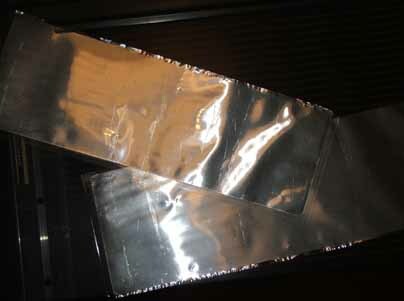 Roll the two sheets up and attach a couple of wires to the tinfoil at each end as shown in figure 1. The capacitance was generally around 6.6nF but depended on how tightly the plates were rolled up. If the capacitor failed it was generally due to an insulation breakdown. The result was a puncture of the dielectric (plastic sheet). This was always found at a sharp point on the tinfoil. The smoother the edges the better. rounding the internal corners also helps. 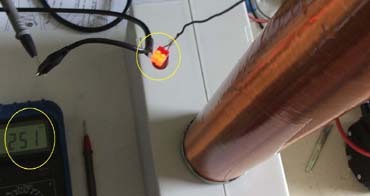 The trick for a Tesla or air core resonant transformer is to have the primary and secondary coils in tune with each other. If they both resonate at the same frequency your well on your way to a working coil. A nice way of working out the resonant frequency of a coil is to use a signal generator and a couple of LEDs as shown in the strangely arranged circuit below. There is no connection with the meter probe or top load capacitor. The image below shows the circuit in figure 2 being used to check the resonant frequency of the coil. At resonance, the two LEDs light up as circled below. A frequency meter displays 251Khz. Note that the LEDs will light at harmonic frequencies but will be brightest at the fundamental frequency. The resonant frequency will alter if anything conductive is brought close to the coil.